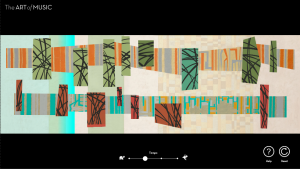 Balboa Park Online Collaborative (BPOC) and The San Diego Museum of Art (SDMA) came together to create the Art of Music Touchtable for SDMA’s Art of Music exhibition. Exploring broad interpretations of music, the exhibition incorporated objects ranging from Beethoven manuscripts, to hand‐crafted instruments, to works by Matisse and Picasso. SDMA knew it wanted a way for visitors to create music in the gallery and see the similarity between art and music composition. Brainstorming sessions with BPOC led to the Art of Music Touchtable, which embodied exhibition themes by highlighting connections between the two artforms. 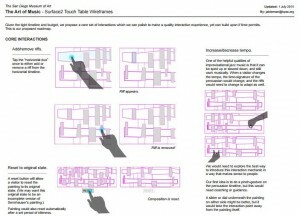 The touchtable appeared in a section of the exhibition about synaesthesia, the mixing of senses, where one might see a color when music plays or hear music upon seeing different environments. 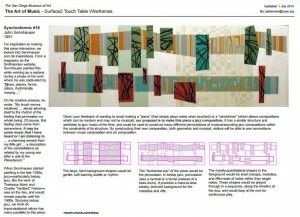 The touchtable was based on and placed next to John Sennhauser’s painting, Synchroformic #18 Horizontal Duo. Sennhauser was a 20th‐century abstract artist whose work was influenced by jazz. Since Sennhauser painted during a time when bebop jazz was popular, BPOC chose open‐source instrumental tracks of Dizzy Gillespie’s bebop classic “Groovin’ High” to complement the the painting’s style and timeframe. 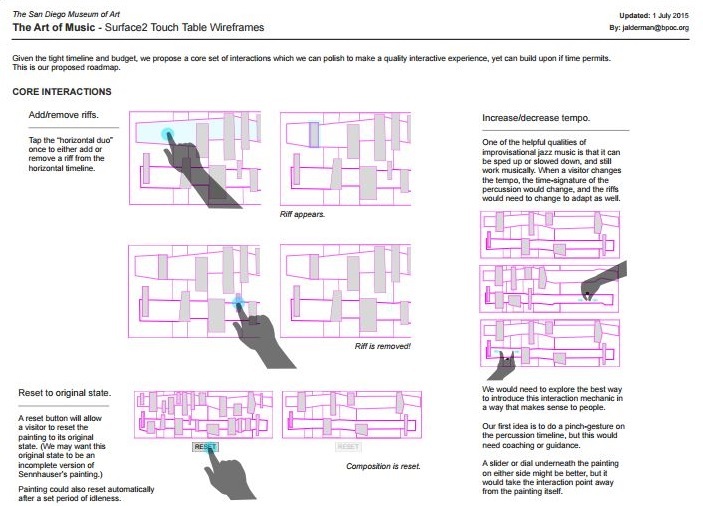 The final touchtable provided an interactive and exploratory experience. 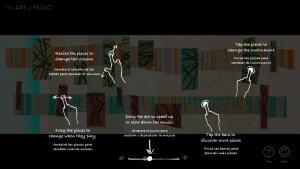 A landing screen explained how to interact with the colored shapes in the painting and how to change tempo (on a sliding scale from a turtle to rabbit). 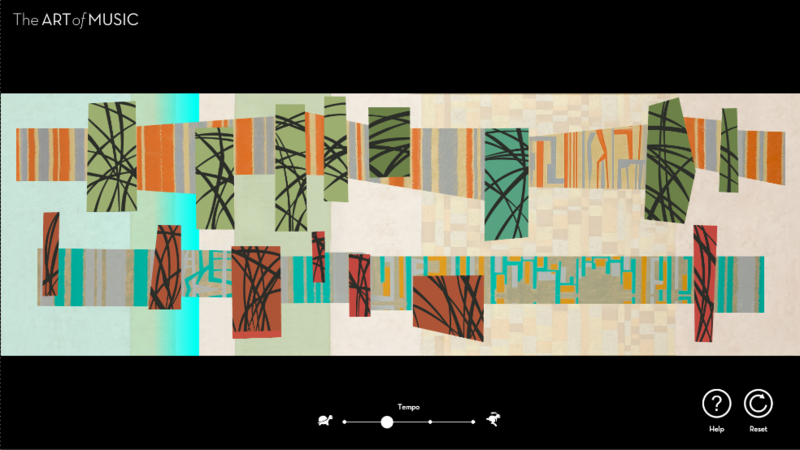 Shapes in the painting represented bebop riffs of bass, guitar, and piano from “Groovin’ High,” backed by the horizontal bars of percussion. Positioning the shapes in the painting determined when riffs were played, and resizing them would change the riffs’ volume. Visitors who created an avant‐garde painting generated a disorganized musical composition. Those who composed a balanced, geometrical painting created a harmonious sound. 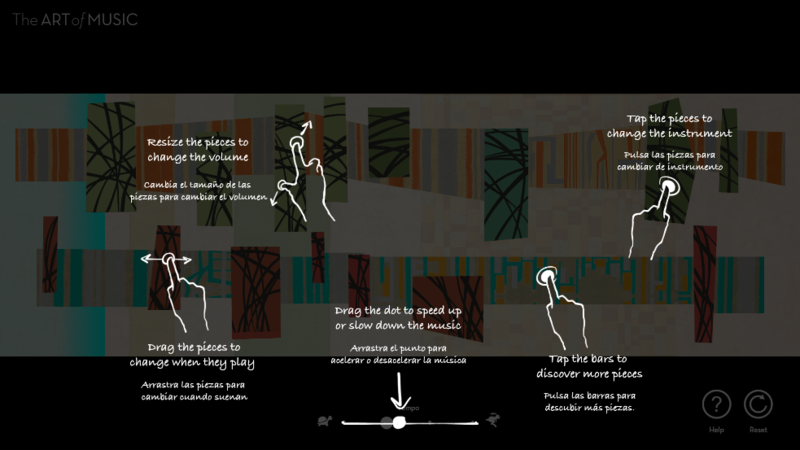 The Art of Music Touchtable thoughtfully complemented the exhibition so well, that Mexico City’s Museo del Palacio de Bellas Artes inquired about incorporating the touchtable into their exhibition. In service of SDMA’s vision, the touchtable challenged visitors to interact with an exhibited artwork, while learning about exhibition themes on a deeper level. Visitors dragged, resized, played, and discovered, coming away with a better understanding of art, music, and the interesting and complex relationship between the two. 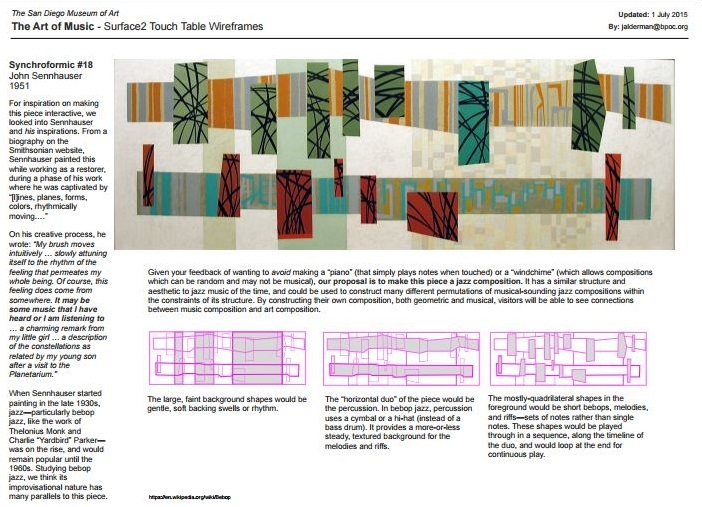 The Art of Music Touchtable was produced by Balboa Park Online Collaborative for The San Diego Museum of Art (SDMA). The project concept was conceived of by Chad Weinard and Brinker Ferguson and was carried out by Nik Honeysett (Project Director), Aimee Reed (Project Manager), Jason Alderman (Contracted Experience Designer and Developer), and Wesley Hsu (Contracted Developer). Brittany Salyers served as project manager and subject matter expert for SDMA.